Most of us are aware of the outdoor air pollutants such as industrial gases, vehicular exhaust, and dust, and its impact on the overall health. But what we tend to ignore is the fact that just like outdoor pollution, indoor air pollution is also a serious cause of concern. According to the latest World Health Organization (WHO) report, 8 million people die every year globally because of air pollution. Among these, 4.3 million die because of air pollution from household sources and 3.7 million die because of ambient (outdoor) air pollution. Indoor air pollution can be up to 10 times worse than outdoor air pollution. This is because lack of ventilation causes the potential household pollutants to build up more in contained area than in open spaces. 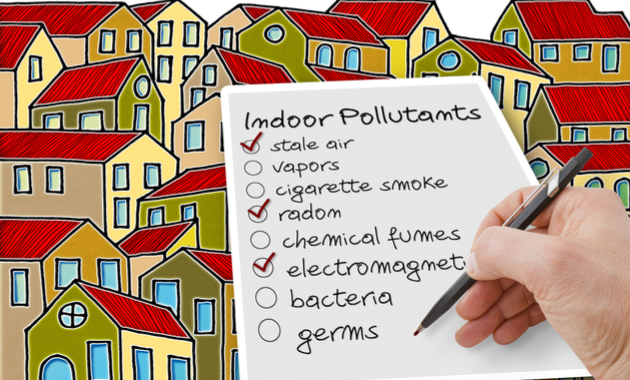 The major sources of indoor air pollutants include gases produced during cooking, polishing materials, cosmetics, dust mites, mattresses, carpets, molds, cigarette smoke, mosquito coils, etc. In this article, we explain the ill effects of indoor air pollutants on the overall health right from cataract to cancer. According to a 2014 study published in the Indian Journal of Community Medicine, the ill-effects of indoor air pollution include premature deaths due to various problems such as pneumonia, cataract, cardiovascular diseases, etc. And the people who are at a high risk of suffering from health complications due to household pollution include women and young children as they spend most of the time at home. Here are the five most common and serious health problems associated with household air pollution. Pneumonia: It is estimated that pneumonia accounts to around 44% of all the respiratory problems caused by indoor pollutants. According to the World Health Organization, the exposure to smoke in households increases the risk of acute lower respiratory tract infections, especially in young children. Nitrogen dioxide (NO2) is one of the common air pollutant, which can impair pulmonary function and thus, increase the risk of pneumonia. The major source of indoor nitrogen dioxide includes the use of gas appliances (cooking) and water heaters including the ones which are poorly maintained. Chronic Obstructive Pulmonary Disease (COPD): Around 54% of all the respiratory problems due to indoor pollution are from chronic obstructive pulmonary disease (COPD). It is a lung condition that may cause progressive and irreversible obstruction to the airflow, thereby causing difficulty in breathing. Nitrogen dioxide was found to cause a marked increase in airway inflammation and also lead to increased mucus production, which are the characteristic features of COPD. The other common symptoms of COPD include coughing, wheezing and shortness of breath. Household air pollution is one of the vital risk factors for COPD and is known to be an important cause of COPD in people who do not smoke. Cataract: Several studies have reported the effect of indoor air pollutants on the eyes. Moreover, there is a strong evidence related to cataract formation and household pollutants, which may account for around a quarter of the total cases of cataract. This is because, indoor pollutants causes absorption and accumulation of toxins into the lens, which lead to oxidative changes, and thus increasing the risk of cataract. The indoor sources of pollutants include smoking, heating, cooking, or candle or incense burning. These sources release many air pollutants, such as carbon monoxide, free radicals, and PM, in particular PM2.5, which are linked to cataract. Formaldehyde, an indoor air pollutant is known to cause irritation of the eye, dryness, and redness of the eyes, which can increase the risk of eye disease, including cataract. Moreover, exposure to tobacco smoke is also known to cause cataract. Cardiovascular disease: A person exposed to household air pollutants is at an increased risk of hypertension, angina, atherosclerosis, ventricular hypertrophy, and arrhythmias, which in turn can lead to a higher risk of cardiovascular morbidity and mortality. Carbon monoxide, a potent air pollutant, decreases the supply of oxygen to the heart. Particulate matter (PM2.5) can penetrate deep into the lungs and enter the bloodstream. Studies have reported that exposure to PM is strongly correlated with a higher risk of cardiovascular disease and stroke. Other indoor air pollutants such as polycyclic aromatic hydrocarbons (PAHs), nitrogen dioxide, sulfur dioxide are also associated with high cardiovascular mortality. Lung cancer: Household air pollutants have also been known to increase the development of various types of cancers. Lung cancer is the most serious health risk from exposure to pollutants such as PAHs and formaldehyde in indoor air. Poor ventilation, due to closed kitchen circuit and cooking gases, has been associated with a 49% increase in the risk of lung cancers. It is already a well-known fact that tobacco smoke increases the risk of developing lung cancers. Chronic exposure to tobacco smoke decreases cellular immunity, antibody production and local bronchial immunity, which increases the susceptibility to infection and cancer. The risk is, even more, higher in people who are suffering from chronic lung inflammation or injured lung tissues. The household air pollutants are also known to increase the risk of other health problems, such as asthma, ear infections, tuberculosis, nasopharyngeal and laryngeal cancers, cervical cancer, low birth weight, and stillbirths. One of the most simple and effective ways to improve indoor air quality and prevent the health risks associated with household pollution is to buy an air purifier. According to a 2016 study by Indian researchers, air purifiers have been suggested as remedial measures to curb indoor air pollution. It is shown that the use of air purifiers for just a couple of hours has been shown to reduce PM2.5 levels by 57%. Moreover, it also caused a significant reduction in the levels of inflammatory markers in the blood, thereby improving your cardiovascular health. It also helps you to breathe cleaner air and protect you from various health complications. This article is sponsored by Honeywell Air Purifiers. Are You Applying Mosquito Repellents Correctly? 5 Nuts That May Add Healthy Years To Your Life! Do Hair Dyes/Colors Damage Your Hair Permanently?